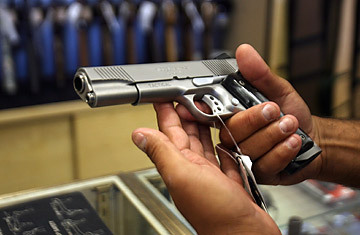 A customer samples a handgun at a shop in Glendale, Calif.
Americans are afraid of this economy. As a result, they're getting locked and loaded. To wit: Jacquita Baker, a soft-spoken single mother from Kentwood, Mich., near Grand Rapids. She works as an administrative assistant at the Grand Rapids Urban League and is studying criminal justice at a local university. As of Monday, she's the proud owner of a shotgun. Why bear arms now? "The economy played a large part in my decision," says Baker, 27. "When people don't have jobs, they might go breaking into people's homes. I want to be safe in my home." According to the SportsOneSource, a research firm that tracks the sporting-goods industry, firearms sales in large retail outlets are up 39% this year. Shops across the country are reporting ammunition shortages because stores can't meet demand for bullets. Data from the FBI's National Instant Criminal Background Check System, which the industry uses as a proxy for overall firearms sales, are also revealing. From November 2008 through March 2009, FBI background checks, which are required every time a federally licensed gun dealer makes a sale, rose 29.3% over the same period a year earlier. In November alone, checks jumped 42%, to 1,529,635, the largest monthly total in the decade that the system has been in place. "Consumer demand is unprecedented," says Larry Keane, general counsel for the National Shooting Sports Foundation, a trade association for the firearms and ammunition industry. The last Democratic President, Bill Clinton, put into law an assault-weapons ban in 1994. President George W. Bush allowed that ban to expire, but last month Obama's Attorney General, Eric Holder, said the Administration wanted to reinstate Clinton's ban. "The gun culture is hypersensitive," says Miles Hall, an Oklahoma City gun-shop owner. "If someone sneezes in Washington, we hear it and get nervous. There's a lot of anxiety out there." For gun-control advocates, this dynamic is bitterly ironic. Tough government talk against firearms, amplified by the Obama Administration's popularity, has actually helped spark a sales increase. It's yet another cost of good intentions. The recession is another factor in the sales jump. Guns are expensive  Baker, for example, paid $200 for her shotgun  yet fear trumps the cost of a weapon for people worried that the economic crisis will lead to more crime. "Protection of the family, protection of the home, is utmost on people's minds," says Keffer. Many big cities have indeed seen crime tick higher during the downturn. But in the wrong psyche, this sentiment can carry deadly consequences. For example, the mother of the Pittsburgh man who shot and killed the police officers said her son had been stockpiling guns and ammunition "because he believed that as a result of the economic collapse, the police were no longer able to protect society." Gun advocates stress that a few extreme cases shouldn't penalize law-abiding citizens who exercise their Second Amendment right to bear arms. Roy Richmond, for example, just bought his first small handgun. He's the heat-packing pastor of a nondenominational church near Oklahoma City. He's carrying the weapon for protection. "Things are getting worse and worse," he says. "There needs to be some people out there with guns." With the weapons business booming, Richmond and his fellow firearms advocates are seeing their wish fulfilled.